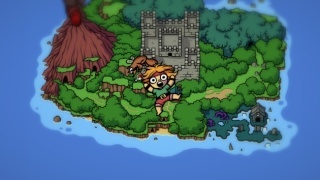 Ittle Dew is the cute main protagonist of a topdown Zelda-style action-adventure. We don’t know why Ittle happened to be on a raft somewhere in the ocean, accompanied by a talking, flying and potion loving fox fairy sidekick, but soon enough they crash into an adventure island of sorts. Instantly you grasp some of Ittle Dew’s most endearing qualities: Beautifully animated and colorful handdrawn 2D graphics that remind of Tingle’s Rosy Rupeeland, and an awesome melodic soundtrack giving Zelda vibes through its variety of memorable instruments. With such an inviting outset Ittle be hard to put this game down. Stranded on the beach the only way to the main land is through a short Tutorial Cave which explains the basic puzzles: Switches and enemies you have to hit with your stick, boxes you can push around, crystals that need to be activated in pairs, and barricades that disappear if you clear a room. There is also a locked path early on, so a little bit of backtracking is necessary to find all the secrets. As you might have already guessed it’s well-known Zelda-gameplay, but not without its own twist. On the main land you’ll find a shopkeeper who sells weapons and tells stories about the history of the island. 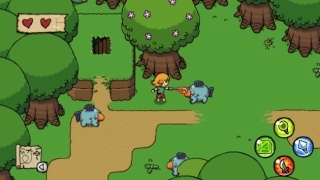 The story is driven forward by funny dialog between the characters and even enemies. Ittle isn’t the type to make friends easily (the inhabitants seem crazy anyway) and rather wants to leave. However, to get away from the island you have to find an artifact from the huge castle that’s dominating the center of the map. Once you’ve found enough treasure in the castle you can buy weapons at the shop. The difference between this and Zelda is that depending on your weapon choice you get thrown into one of three main dungeons. The order in which you buy weapons opens new paths through the dungeons since each can be used not just to attack but also to solve puzzles. Four different playthroughs are possible, and a best time for each scenario is saved. Three dungeons isn’t very much but there’s high replayability for those who want to play again. The overworld always remains the same, but the dungeons change drastically. Apart from the castle and the three main dungeons a mindbending master cave that will test all your skills and brains is waiting for you early on as a teasing sidequest. Of course there are plenty of small caves, shortcuts, and hidden passages in the compact overworld as well. Find collectible cards that show all characters, special map upgrades, and “heart pieces” that extend your energy meter. Things like these keep every completionist engaged. You can even unlock a nice artwort gallery. So there’s about 10 hours of gameplay just for completing this game the first time. But the game is also made with speedrunning in mind: Veterans clock in under an impressive 20 minutes using pro shortcuts. The game is of balanced difficulty, but sidequests can be very puzzling. The press of a button lets you talk to your talking fox fairy who’s giving out hints on what to do next. Another button is to switch between the very practical off-tv-mode and a map. Ittle Dew is an awesome little game, but it’s also not fixed yet. There are a few bugs dampering the experience. The game froze twice in the testing phase, seemingly at random. There was also a bug crashing the game (error code window popping up forcing you to quit the game). The last issue could also be the biggest: There’s one place in the game where you can leave the world and get out of bounds. If you stray too far you can lock yourself up inside objects. Since the game saves automatically every few screens, you can get stuck and be forced to start over from scratch. I had this happening in the first half hour so I was lucky to not lose much progress and making the same mistake again. 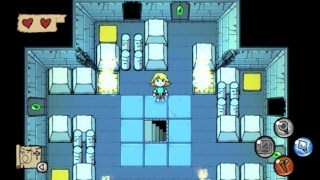 If you cannot get enough of Zelda, or want a beautiful little action-adventure with lots of puzzling, charm, and ingenious dungeon design then you should definitely consider checking out Ittle Dew. Yes, Ittle Dew’s credits roll when a masterpiece like A Link to the Past puts an epic shadow world in front of you but if you can live with a shorter experience, this is pretty fun and worth it! @SKTTR 's latest review is now live! Enjoy. This is another game on my list if nothing else because of the Zelda references. The sad thing is I'll probably never get it because of lack of time and too much else to play. I wish I could dedicate more time to gaming like when I was younger but I wouldn't change a thing in my life as it is. At the very least this will go on my wish list.